Includes is the Premium Well Padded Camera CASE / BAG and Full Size 72″ inch TRIPOD Accessories KIT, the Ideal Traveling Accessories SONY ALPHA a7 a7S a7R a7II a7Rii, a7IIK, Alpha 7 II, Alpha, 7, 7S, 7R, Alpha 7, Alpha a5100, a6000, a5000, a3000, NEX3, NEX3N, NEX5N, NEX5R, NEX5T, NEX6, NEX7, NEXF SLTA77 II, SLTA99, SLTA58, SLTA57, SLTA37, SLTA77, SLTA35, SLTA65, SLTA55, SLTA33 DSLR Cameras. Additionally included in the Kit is a Full Size DURABLE 75″ inch Tripod with 3-Way Pan-Head, Bubble level indicator, 3 Section aluminum alloy lock in legs that folds back into 22.5″ inches. The Tripod is lightweight and includes a Backpack style Carrying Bag Making it an Ideal Camera Accessory to travel with. 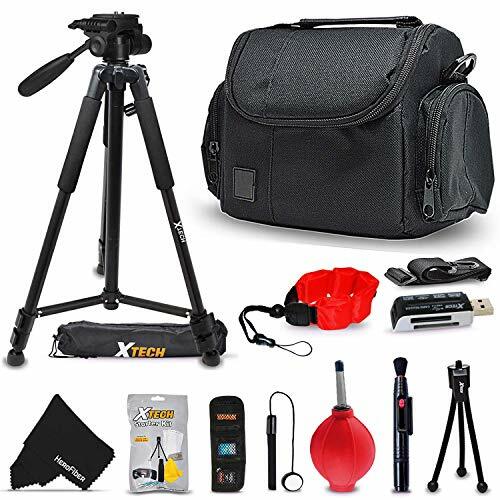 Premium Well Padded Camera CASE / BAG and Full Size 75″ inch TRIPOD Accessories KIT includes the Ideal Traveling Accessories SONY ALPHA a7 a7S a7R a7II a7Rii, a7IIK, Alpha 7 II, Alpha, 7, 7S, 7R, Alpha 7, Alpha a5100, a6000, a5000, a3000, NEX3, NEX3N, NEX5N, NEX5R, NEX5T, NEX6, NEX7, NEXF SLTA77 II, SLTA99, SLTA58, SLTA57, SLTA37, SLTA77, SLTA35, SLTA65, SLTA55, SLTA33 DSLR Cameras. Includes a Full Size DURABLE 72″ inch Tripod with 3-Way Pan-Head, Bubble level indicator, 3 Section aluminum alloy lock in legs that folds back into 22.5″ inches. The Tripod is lightweight and includes a Backpack style Carrying Bag Making it an Ideal Camera Accessory to travel with.